My love for the wines of Stoney Ridge goes back a long way. Only the 18th licensed winery in the history of Ontario’s modern wine industry (which essentially began in 1975, when Inniskillin was the first Ontario winery to successfully apply for a license), Stoney Ridge made some of Canada’s most interesting and best wines in those early, almost pioneer-like days. In a blind tasting of worldwide Merlots I organized in Rome in 1990, the 1988 Stoney Ridge Merlot, though not exceptional, avoided the shame of finishing last on the night’s tally of favorites. Jim Warren, Stoney Ridge’s winemaker, was one of Canada’s first wine stars and turned out many memorable wines from what was a converted farm on Ridge Road in Stoney Creek (hence the winery’s name). Perhaps the only caveat then was Stoney Ridge’s tendency to produce too many wines in different small lots (at one point in 1997 there were over sixty different wines produced) that weren’t all of the same high quality level. The winery has had its up and downs over the years. It was acquired in 2013 by Bob McCown, one of Canada’s best-known sports radio and television broadcasting personalities, and is now called Stoney Ridge Estate Winery. 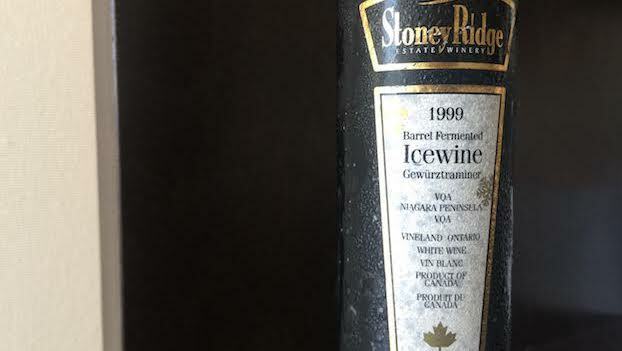 The 1999 Stoney Ridge Gewürztraminer Icewine is a flash from a glorious past. Gewürztraminer doesn’t tolerate extreme cold and its thin skins aren’t ideal for icewine production, but this wine is a major success. Dark amber in color, with deep, complex aromas and flavors of burnt cane sugar, crystallized mango, passion fruit coulis, smoke and dark honey, the 1999 boasts a multilayered texture and a long suave finish that features a slightly bittersweet note. The 1999 is rich, luscious and precise, but the acidity, never a strong suit for the variety, is on the low side, so any remaining bottles are best drunk up. 90/Drinking Window: 2017.